The battle for recognition of the differences between veteran and civilian health issues is far from over. Veterans have health care concerns due to their military service and cannot afford to allow these veteran-centric health needs to be overlooked. On May 17 Tom Berger, Ph.D., the executive director of VVA’s Veterans Health Council, spent the afternoon on Capitol Hill reminding lawmakers exactly what those differences are and why they should pay attention to them. Earlier in May the U.S. Preventive Services Task Force published recommendations on screening for prostate cancer. The USPSTF is an independent volunteer panel of non-federal experts in prevention and evidence-based medicine that makes recommendations based on reviews and assessments of existing research. These recommendations are focused principally on services for adults and children in the primary care setting or services a primary care physician might refer out. The recommendations also can play a role in insurance coverage. American men face an 11.2 percent lifetime risk of being diagnosed with prostate cancer. Of that 11.2 percent, 2.5 percent face the risk of dying from the disease. Because of this risk, prostate cancer screening for men ages 55 to 69 was moved from a Grade D to a Grade C recommendation. This means that primary care physicians are more likely to screen men ages 55 to 69 for prostate cancer. It also means men age 70 and older are less likely to be screened for prostate cancer because the risk of dying from it drops significantly. Once men are over the age of 70, prostate cancer is more likely to be slow-growing and nonaggressive. Therefore, the patient may be at a higher risk from being screened with careless biopsies and injections than from the cancer itself. While this is great news for civilian American men, for Vietnam veterans exposed to Agent Orange it is dangerous misinformation. These guidelines may lull veterans into a false sense of safety because they actually may be subject to a much more virulent strain of the disease. Compounding that, the guidelines may lull health care providers into complaisance well. Multiple scientific studies link exposure to Agent Orange to an increased risk for prostate cancer. 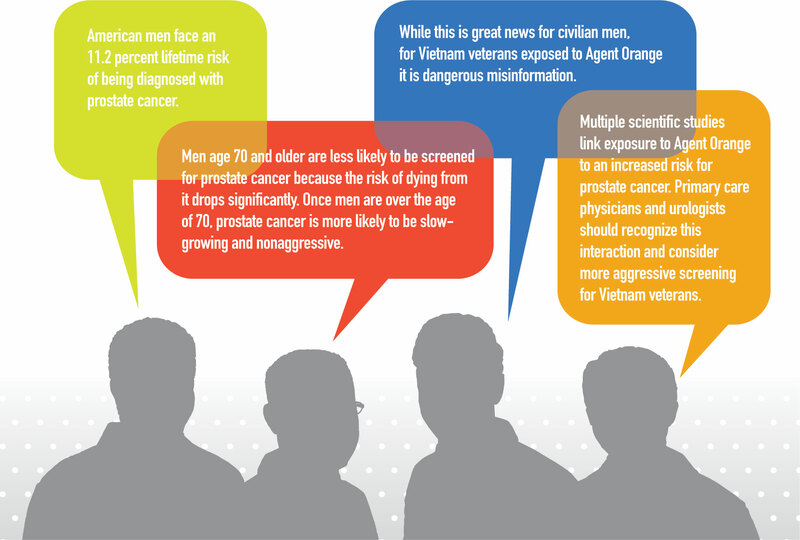 Many others correlate exposure to Agent Orange with a higher risk for life-threatening prostate cancer. This is why the VA recognizes prostate cancer as a presumptive condition for veterans exposed to Agent Orange. Even within the VA, appropriate care for Vietnam veterans with Agent Orange exposure has been a battle. Back in 2012, the VA’s Deputy Undersecretary for Health issued a letter that instructed VA hospitals not to test for prostate cancer anymore. When confronted by the Veterans Health Council and the Men’s Health Network, the VA backtracked and changed that policy. What can you do to protect yourself? Have an open conversation with your primary care physician about your risk of prostate cancer, whether at the VA or with a civilian provider. Until Congress mandates veteran-centric health care education in medical schools and colleges, the burden falls upon veterans to hold their health care providers accountable for knowing veteran-specific health risks. An easy way to facilitate this discussion is to use the Military Health History pocket card created by the VA’s Office of Academic Affiliation. This pocket card has a list of health topics that patients and primary care physicians can discuss. The pocket card can be downloaded at here. Another website, haveyoueverserved.com, created by the American Academy of Nursing, also features a pocket card that can be downloaded to facilitate discussion. Contact your Representatives and Senators to demand veteran-centric healthcare education in medical and nursing schools. The Veterans Health Council continues to educate health care policymakers on the importance of veteran-centric care.